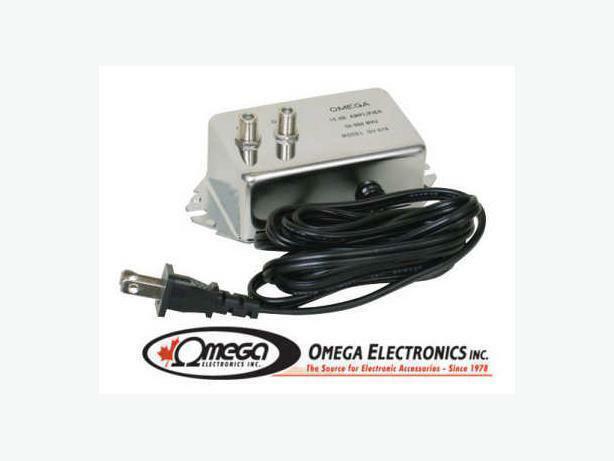 Omega's OV-618 video signal amplifier is designed to extend the system line where additional TV sets, VCRs and other components are required without loss of reception quality. It also helps improve signal transmissions through your household cable by increasing the signal strength and overriding any outside signal interference. Signal Amplifier amplifies the VHF signal from cable TV, a VCR a video disc player, a color computer, or a video game. This amplification is necessary when a signal is sent through long lengths of cable (100 ft. or more) or when the original signal is too weak to produce a good picture at the receiving unit (TV/monitor or VCR). TV sets delivering snowy pictures? You could have signal loss due to the length of cable or due to the number of splitters you are using. Insert this amplifier into the coaxial line near your antenna or signal source. Note: This amplifier is designed to amplify existing signals. It will not enhance a poor signal.